In its zeal to revive the memories of the JRPGs of yesteryear, Lost Sphear fails to leave a memorable impression of its own. Bland and unambitious save for its combat, Lost Sphear draws so heavily from the traditions of past JPRGs that it fails to build a personality of its own. What is it? A retro-styled Japanese roleplaying game centered on restoring the world by collecting scattered memories. Lost Sphear is all about filling in the blanks. In the opening moments, I’m playing as Kanata, a young swordsman who finds his village and the surrounding countryside scrubbed from the earth after he and two buddies went fishing. Not destroyed, mind you—it’s as though someone smeared the eraser tool over the great Photoshop file of the world and left behind an impenetrable white substance resembling sparkly toothpaste. Kanata and I, though, we’ve learned to harvest memories and stuff them in our pockets. (It’s a JRPG: don’t think too hard about it.) We hold a handful of memories aloft, they dazzle and shine, and the town shimmies back into the blank spaces as though we’ve reverted to a previous save. Hooray and all that, but I want to know more about this mystery. Did the townspeople ascend to a higher plane of existence? Did they die and I brought them back to life? Eh, for all the townsfolk who seemed disturbed by what just happened, someone may have merely farted. There could be more to it, but there isn't, just missed opportunities to tell an interesting story. Lost Sphear is all nostalgia and nothing beyond it. The whole of Lost Sphear feels like that. Square Enix created developer the Tokyo RPG Factory precisely to fill a supposed demand for new 2D JRPGs in the style of the Chrono Triggers and Final Fantasies from decades past, and the first fruits of those efforts culminated in 2016’s moody but average I Am Setsuna. I Am Setsuna's strength was the way it reached beyond mere nostalgia by aiming for artistry, which revealed itself in its snowbound aesthetic and haunting piano score. Though flawed and overlong, it used graphical minimalism to leave the impression of being an interactive haiku. Lost Sphear has little of that vitality. It aims for more visual variety by ditching I Am Setsuna’s monotonous snowy fields, but its empty prairies are drab rather than haunting. Lost Sphear is all nostalgia and nothing beyond it. Its ingredients are active-time battles, JRPG character archetypes, and 2D sprite avatars, all swirled together with a predictable story as if that alone suffices to produce a dish we’ll heartily devour. But where’s the seasoning? Where’s the soul? It’s certainly not in the story. I like the idea of using memories to restore a blighted world, but the tale itself is so stuffed with JRPG stock characters such as the broody white-haired spoilsport that it veers toward parody. Some are outright obnoxious, such as the crossbow-wielding Locke and his penchant for griping about missing a meal while the world vanishes around him. Even the business of memory collection lacks spark. Lost Sphear is briefly creative, such as when I created memories by highlighting key words in conversations, but most of the time I found the memories simply stuffed in crates or glittering in the weeds. I might as well have been collecting snowberries in Skyrim. Elsewhere, there’s little original here save perhaps the ability to uncover 'artifacts' on the world map with memories that grant bonuses such as seeing enemy health bars or boosting walking speed. All of this would have bored me into quitting had it not been for the decently enjoyable combat system. It builds off the active-time-battle design of Chrono Trigger (and I Am Setsuna) but distinguishes itself by letting characters move about the screen each turn for advantageous positioning. Some of the characters I could switch into the four-man party are far better suited for this than others, such as Van and his ability to blast around five enemies at once with his magic rays. Others can swat merely one, which rendered them useless liabilities in Lost Sphear’s challenging latter hours. Various special abilities for each character can be bought and equipped, and a momentum gauge adds a layer of complexity by granting boosts for well-timed button presses. Combined, all this gets exciting hours in after Lost Sphear builds some steam, and I found the experience of deciding which party members to bring and which abilities to equip rewarding in a way that reminds me of deck building. It encouraged me to think, as Lost Sphear is fond of tossing in encounters with revivable and summonable enemies that punish the unprepared. For a game that seems intent on checking all the boxes of classic JRPGs, it probably shouldn’t come as a surprise that mech suits make an appearance as well. Unfortunately, they’re barely more effective in combat than normal attacks save combos between the other mechs, and they’re limited by a charge gauge that rapidly depletes. As did my interest. 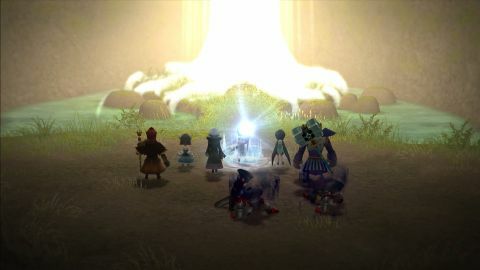 Lost Sphear attempts to fill a niche in the current gaming market by delivering an old-style Japanese RPG, but at its best it merely fills the 20 or so hours it takes to finish it. Lost Sphear isn't terrible, but that's time that could be spent better elsewhere and for less than the $50 price tag. Rather than an RPG that merely reminds me of Chrono Trigger (and never explains what the hell a "Sphear" is), I'd have preferred a PC remake of Chrono Trigger itself.